BE OUR GUEST! JOIN US FOR OUR MAY CLASSES! Sales of existing homes hit an 18-month high, with transactions of single-family homes, townhomes, condominiums and co-ops, advancing 6.1 percent to an annual rate of 5.19 million in March, according to last week’s report form the National Association of Realtors. Compared annually, March’s sales were 10.4 percent above a year ago, which marked the largest annual increase since August 2013’s 10.7 percent increase. “The combination of low interest rates and the ongoing stability in the job market is improving buyer confidence and finally releasing some of the sizable pent-up demand that accumulated in recent years,” NAR chief economist Lawrence Yun explained. The median price for existing homes of all types in March hit $212,100, which marked a 7.8 percent above March 2014. Total inventory of existing homes for March — a key figure real estate watchers are monitoring as it impacts prices — grew 5.3 percent to 2 million existing homes available for sale. Meanwhile, sales of new homes were a mixed bag. On the face of things, transactions of new single-family houses in March plummeted 11.4 percent to an annual rate of 481,000, according to last week’s report from the Census Bureau and the Department of Housing and Urban Development. However, given that February posted the strongest sales month for new homes in seven years, it’s not surprising that March wouldn’t maintain that pace. Moreover, what is also noteworthy is that, compared on annual basis, March’s sales were a whopping 19.4 percent higher the March 2014’s pace of 403,000. That is room for confidence in the spring selling season’s vitality. “Our expectation is that the strengthening of demand is sustainable and should drive new-home sales for all of 2015,” Richard Dugas Jr., CEO of homebuilding giant PulteGroup Inc. told the Wall Street Journal. Looking at price and supply, the median sales price for new homes sold in March was $277,400 and the average sales price was $343,300. The estimated supply new homes for sale at the end of March was 213,000, representing 5.3-month supply. Turning to lay-offs, first-time claims for unemployment benefits filed by the newly unemployed during the week ending April 18, notched up to 295,000, a gain of 1,000 claims from the preceding week’s total of 294,000, the Employment and Training Administration reported last week. Similarly, the four-week moving average — considered a more reliable, less volatile gauge of lay-off activity — grew to 284,500 claims, an increase of 1,750 claims from the prior week’s average of 282,750. Despite the slight increase, because claims remained below the 300,000 mark, most analysts maintained a positive outlook on the labor market. “Overall, the level of claims remains low and is consistent with a healthy labor market,” JPMorgan economist Michael Feroli told Reuters. Tuesday — April consumer confidence from The Conference Board. Wednesday — Advance first quarter GDP from the Bureau of Economic Analysis. Thursday — Initial jobless claims for last week from the Employment and Training Administration; personal income and spending for March from the Bureau of Economic Analysis. Friday — April constructions pending from the Census Bureau; April car and truck sales from the auto manufacturers; April consumer sentiment from the University of Michigan and Thompson-Reuters Survey of Consumers. When the National Association of Realtors® surveyed FSBOs (for sale by owner) about what challenges they faced when attempting to sell their homes without the aid of a real estate professional, 13 percent said that setting the right price was a key challenge. WHAT’S THE GOOD NEWS? APRIL EDITION! 13,000 insurance industry jobs are headed to North Texas. That’s how many combined insurance industry positions are being created in Plano and Richardson by Boston-based Liberty Mutual and Illinois-based State Farm. Both companies are in the process of moving major operations into North Texas. Texas data speaks volumes to the insurance companies. The pot is huge: Texas residents paid $15 billion in auto insurance premiums last year, $7 billion in homeowners premiums and $10.5 billion in life insurance premiums. The Texas unemployment rate slipped to 4.2% in March 2015, the lowest mark in nearly eight years. Flower Mound’s unemployment rate was 3.7%, while the nationwide jobless rate was 5.5% in March. Allen is now ready to kick off its $85 million convention center and hotel complex. The city of Allen and the Allen Economic Development Corp. are providing the 6.7-acre construction site for the hotel. The convention center complex will be located at North Central Expressway at Bethany Drive, across the street from the Watters Creek shopping and apartment development. The hotel will have 290 rooms, and the convention center will include 64,000 square feet of meeting space. Foreclosure activity in the U.S. was at an eight-year low in the first quarter of 2015, despite an increase in activity in March, according to the most recent foreclosure report from real estate data company RealtyTrac. The number of residential properties with a foreclosure filing — default notice, scheduled auction or bank repossession — decreased about 8% from the first quarter of 2014. The 313,487 properties in foreclosure are the fewest in the market since the first quarter of 2007. CoreLogic supports that good news agreeing that the current foreclosure rate of 1.4% is the lowest since March of 2007, and the foreclosure inventory has declined every month for the past 40 months. Foreclosures have dropped by 67% from the peak of completed foreclosures in September 2010. Vacation home sales rose 57% last year over 2013, to 1.3 million properties, well above their most recent peak level in 2006, according to National Association of Realtors. In fact, vacation home sales accounted for 21% of all real estate transactions last year, their highest market share since the survey was first conducted in 2003. The same recently released survey by NAR showed that investment home sales in 2014 decreased 7.4% to an estimated 1.02 million in 2014 from 1.10 million in 2013. Investment sales made up 19% of all transactions in 2014, down from 20% in 2013. In a manner of speaking, staging your home is putting its best foot forward: you’re setting up each room to look inviting to prospective buyers of all types. Showcase your home’s best features, and minimizes any flaws. Ideally, you’d start with a completely empty home, painted in neutrals and perfectly clean. In reality, you get as close to this ideal as you can by boxing up personal items, clearing out closets and stacking everything neatly in your tidy and [now] organized garage and attic. Items that must stay out in the open need to go in bins or baskets to keep your home free of clutter. This includes toys and kitchen and bathroom items you need to use daily. And of course everything must be dusted and cleaned of fingerprints and footprints! Your rooms should look inviting, but they still need to have the minimum furnishings possible so buyers can imagine their own belongings in there more easily. Play to the strengths of each room by accenting its best features. Create conversational groupings in common areas. Bright lighting make the room look warm and welcoming. Chase away dark corners by using both ambient lighting and accent lights. Your patio and yard should also be selling features. Clean up the furniture, make sure the cushions aren’t sun-faded, and get the garden in shape. If you don’t have a green thumb, large potted plants can dress up the exterior. Dress up a Spartan guest room with a comfy chair and pretty lamp to create a cozy reading spot. The guest room should be obviously a guest room; the same goes for the office. Ambiguity in a room’s purpose can be confusing to homeshoppers. Make it clear what each room is for. If you have an oddly shaped landing, or a little nook in the living room, don’t ignore it: show its potential. This can be the hardest part! But while your home is on the market, you need to keep the garbage empty, the laundry folded, the pet toys out of sight, and the cap on your toothpaste. It’s hard to show your home while you’re still living in it, but you need to think about what a new homeowner will be looking for: a fresh start and a place for their family and their belongings. You want your home to appeal to the most number of people possible. Keep these tips in mind to help your home sell quickly and for more money! 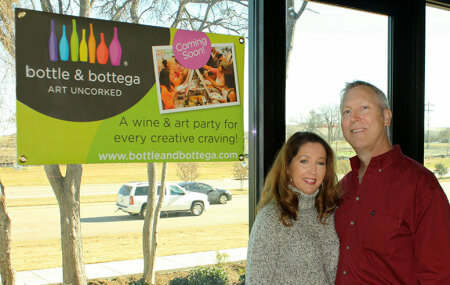 “Bottle and Bottega is a BYOB art party studio,” explained longtime Flower Mound resident Glenn Olson of his business that is expected to open in Building 1 of the Shops at Lakeside in February. A bottega [boh-TEY-guh], by the way, is defined as the studio of a master artist, in which students learn by participating in the work. With the space to accommodate 60 painters, Bottle and Bottega offers the perfect setting for adult birthday parties, baby/bridal showers, bachelorette parties, or nights out with friends. 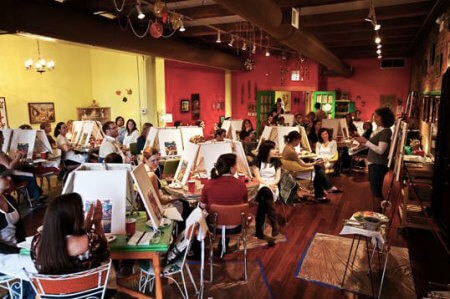 A professional instructor— at least one per every 15 painters — helps guide guests with their canvas creations (or other art media, including glass painting and mosaics). “Bottle and Bottega will be a great place to meet and gather with people,” said Samantha Olson who, in addition to being a successful Zumba® instructor, is helping her husband with the new business. While affluent professional women, ages 25-45, comprise the largest demographic, the studio’s regularly scheduled public events will have all the ingredients for a great date night. “We will stock chilled beer mugs to cater to the guys” Olson said. Corporations also have found that the informal atmosphere combined with the creative activities (not to mention, a little wine) fosters socializing and team building. Companies can also collaborate to create beautiful murals to display in their buildings. “We expect to bring in corporations from around the area including Las Colinas, Dallas, and Fort Worth. Bottle and Bottega was started in Chicago in March 2009 and has grown quickly to 16 locations (including both brick-and-mortar and pop-up studios) in states from Oregon and California to Florida and New Jersey. Another Bottle & Bottega franchise recently began operating in Plano and is expected to move into a studio soon. “Our vision,” explains Stephanie King-Myers, the company’s president, chief operating officer, and co-owner, on the company web site, “is for guests to walk into our studios and feel like they’re having a party in their living room. “I found Bottle and Bottega after a long search,” said Olson, who began investigating franchise opportunities after leaving a career in telecommunications at the end of 2012. Years before, Samantha had retired from her corporate job (after almost 16 years at Mary Kay Inc.) to be a stay-at-home mom to their daughters Shelby and Bryanna. Samantha started her Zumba® business when their daughter Bryanna started school several years ago (she currently attends McKamy Middle School in Flower Mound and Shelby attends Texas State). It took months for Olson to find the opportunity with Bottle and Bottega. But once he did, he knew it felt right. Finding a prime location for the business took even longer. 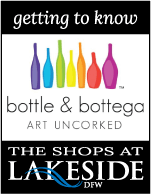 “The demographics are superb and Lakeside’s lifestyle is the ideal setting.